You must have heard about the global cyberattack of WannaCry ransomware in over 200 countries. It encrypted all the files on the machine and asked for payment. Ransomware, which demands payment after launching a cyber-attack, has become a rising trend among hackers looking for a quick payout. Every day it seems another news breaks about cyber-criminals hacking in and stealing data, & information. Private companies, government agencies, hospitals…no one is immune. Cybersecurity is no longer buried in the tech section of organizations, newspapers and websites - its front-page news. With the penetration of the digital movement, cyber-attacks have also doubled year over year, making businesses and government sites more vulnerable. In simple terms cybersecurity is use of digital technologies to protect company networks, computers and programs from unauthorized access and subsequent damage. In recent times, every organization has launched a “go-digital” initiative. This has led to explosion of connected environments. The growing mobility trend has sparked a rapid growth of endpoints that must be secured, and bring-your-own-device (BYOD) programs mean that employees could be accessing sensitive data on unsecured devices. The prevalence of cloud based services and third party data storing has opened up new areas of risk. As businesses adopt the new technologies like Big Data, Analytics, IoT & Mobility, the focus must be on how to safeguard the data spread across devices and cloud. Cybersecurity must be a key factor during your journey to digitally transforming your business, just as you would ensure that your offices, brick-and-mortar store has locks and security systems of the highest quality, your digital storefront must have the same levels of security. If consumers do not trust these digital storefront with their data, or if that trust is broken because of a data breach, the cost to rebuild that trust is incredibly high. The best way to protect yourself is to be suspicious of unsolicited emails and always type out web addresses yourself rather than clicking on links. · Mobile device protection: detect unauthorized devices or prevent hackers from compromising individual devices. · Investment in securing IoT devices – today with everything is connected it is extremely important to secure all access points. Today with machine learning organizations are in a very good position to know what users are doing that can affect the network and increase risk. Artificial Intelligence is used to constantly learn new malware behaviors and recognize how viruses may mutate to try and get around security systems. Recent events have highlighted the growing need for enhanced cybersecurity. In today’s digital transformation, big data has given organization an edge to analyze the customer behavior & hyper-personalize every interaction which results into cross-sell, improved customer experience and obviously more revenues. The market for Big Data has grown up steadily as more and more enterprises have implemented a data-driven strategy. While Apache Hadoop is the most well-established tool for analyzing big data, there are thousands of big data tools out there. All of them promising to save you time, money and help you uncover never-before-seen business insights. I have selected few to get you going…. Avro: It was developed by Doug Cutting & used for data serialization for encoding the schema of Hadoop files. Cassandra: is a distributed and Open Source database. Designed to handle large amounts of distributed data across commodity servers while providing a highly available service. It is a NoSQL solution that was initially developed by Facebook. It is used by many organizations like Netflix, Cisco, Twitter. Drill: An open source distributed system for performing interactive analysis on large-scale datasets. It is similar to Google’s Dremel, and is managed by Apache. Elasticsearch: An open source search engine built on Apache Lucene. It is developed on Java, can power extremely fast searches that support your data discovery applications. Flume: is a framework for populating Hadoop with data from web servers, application servers and mobile devices. It is the plumbing between sources and Hadoop. HCatalog: is a centralized metadata management and sharing service for Apache Hadoop. It allows for a unified view of all data in Hadoop clusters and allows diverse tools, including Pig and Hive, to process any data elements without needing to know physically where in the cluster the data is stored. Impala: provides fast, interactive SQL queries directly on your Apache Hadoop data stored in HDFS or HBase using the same metadata, SQL syntax (Hive SQL), ODBC driver and user interface (Hue Beeswax) as Apache Hive. This provides a familiar and unified platform for batch-oriented or real-time queries. Kafka: is a distributed publish-subscribe messaging system that offers a solution capable of handling all data flow activity and processing these data on a consumer website. This type of data (page views, searches, and other user actions) are a key ingredient in the current social web. MongoDB: is a NoSQL database oriented to documents, developed under the open source concept. This comes with full index support and the flexibility to index any attribute and scale horizontally without affecting functionality. Neo4j: is a graph database & boasts performance improvements of up to 1000x or more when in comparison with relational databases. Oozie: is a workflow processing system that lets users define a series of jobs written in multiple languages – such as Map Reduce, Pig and Hive. It further intelligently links them to one another. 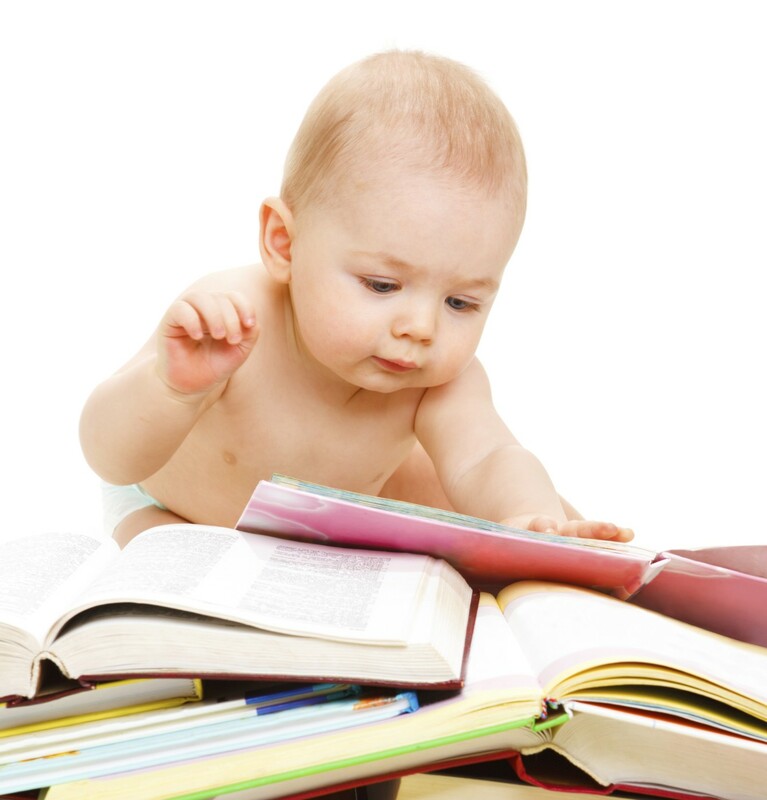 Oozie allows users to specify dependancies. Pig: is a Hadoop-based language developed by Yahoo. It is relatively easy to learn and is adept at very deep, very long data pipelines. Storm: is a system of real-time distributed computing, open source and free. Storm makes it easy to reliably process unstructured data flows in the field of real-time processing. Storm is fault-tolerant and works with nearly all programming languages, though typically Java is used. Descending from the Apache family, Storm is now owned by Twitter. Tableau: is a data visualization tool with a primary focus on business intelligence. You can create maps, bar charts, scatter plots and more without the need for programming. They recently released a web connector that allows you to connect to a database or API thus giving you the ability to get live data in a visualization. ZooKeeper: is a service that provides centralized configuration and open code name registration for large distributed systems. Everyday many more tools are getting added the big data technology stack and its extremely difficult to cope up with each and every tool. Select few which you can master and continue upgrading your knowledge. Today Digital Transformation has entered our life and we have subconsciously using it also in day to day life. Virtual Reality technology has evolved dramatically in the past few years the costs of VR devices has gone down so it is all set to hit mainstream markets soon. While gaming applications like Pokemon Go have attracted most of the attention, there are many other use cases that could have a much larger impact on our lives. Google Cardboard is a super low-cost headset ($15) to which a compatible, VR enabled mobile phone is attached to deliver the VR experience. Other commercial product is Oculus Rift gear which has becomeextremely popular in gaming & business equally. 1. VR for Tourism: do you want to sit on your couch and climb up the Eiffel tower? Or walk on the glass horse shoe at grand canyon? Wild Within is VR app available for experience of travel through rain forest in Canada. Travelers around the world are able to experience a helicopter flight around New York City or a boat ride around the Statue of Liberty. 2. VR for Education: Over last decade eLearning had picked up very much. But it could not deliver hands on experience which is now possible with VR technology. Technicians can actually learn the real life examples and do their bit to solve the problems on the shop floor. Medical students can actually perform surgeries allowing them to make mistakes without any impact on actual patients. 3. VR for Sales: Traditionally automakers have the showroom to show the cars to the customers and explain their features and sometimes a test drive is also possible. But customization of how the interior will look as per their choice was not possible which now can be done via VR. Audi is experimenting this in London, where customer can configure their Audi with accessories as they want and drive virtually in real time. 4. VR in Gaming: who does not know the excitement Pokemon Go had created and reached 50 million users in record time of 22 days. Using AR/VR technology games have changed the life of seniors as well as teens. Game of Thrones has capitalized on VR and gone viral in various countries. 5. VR in Designing: product designing is tedious task and changes to products based on the competition or customization is time consuming. This is where VR helps designers. They can now create the products easily, configure all the features and test them out. It is more popular in construction of buildings to see how the interior will look like. 6. VR in Marketing: With Digital Marketing ads are becoming more intrusive. The best marketing campaigns use VR to create successful campaigns as users get completely immersed into the content, and create memorable experiences. Coca Cola created a virtual reality sleigh ride. New York times releases multiple immersive documentaries in their app. Finnair is showing their Airbus 350 via VR to attract more customers. 7. VR in Sports coaching: The potential for VR in sports in endless. You get all the benefits of real-world interaction, but in a controlled environment. Showing is so much more effective than explaining, and experiencing something first-hand is that much more powerful again. Football, Cricket. Virtual reality technology holds enormous potential to change the future for a number of fields, from medicine, business, and architecture to manufacturing. We are on the roller coaster ride !! With rising concerns about global warming, this immense waste of energy undoubtedly hurts the environment, but it also hurts business. Offices, manufacturing plants, commercial spaces and power grids all stand to benefit financially from better and “smarter” energy management. In his article, “Report: Lofty Energy Management Goals Far Ahead of Reality,” (Panoramic Power, August 5, 2015) Jon Rabinowitz points out that most companies receive data on their energy usage only at the end of each billing cycle, which is usually a month at a time. By incorporating Internet of Things (IoT) technology, energy consumption data will be available in real-time, and energy-reducing measures can be implemented as soon as a problem gets detected (rather than waiting until the end of the month). Integrating smart devices through IoT technology will provide greater visibility into energy usage and help both industrial and commercial enterprises save energy, and as a result, save money. Starting with simple, smart and low cost sensors, like User to User Information (UUI) and Feature Driven Development (FDD) devices, businesses can reduce energy usage and cost by dimming lights, turning off unnecessary equipment and improving the use the cooling/heating apparatus. Software that collects and correlates granular usage data, performs analytics and then converges information to increase efficiency will make manufacturing plants “smarter,” and thus more cost-effective. Local and remote sensors that detect points of inefficiency quickly and perform triage to decrease waste will also reduce the need for maintenance as constant monitoring will detect small issues before they become big problems. Continuous optimization through 24/7 monitoring will assure that energy is not wasted during slow periods in between high-usage spans, while maximizing the use of energy-demanding equipment at critical times. General Electric’s Asset Performance Management software connects disparate data sources in power plants, enabling data analytics to guide energy usage and to increase efficiency (“10 Real-Life Examples of IoT Powering the Future of Energy,” Internet of Business, Freddie Roberts, Oct. 7, 2016). Duke Energy, a Florida-based electric power holding company, has developed a self-healing grid that automatically reconfigures itself when power goes out. Using digital smart sensors at sub stations and on power lines, the system automatically detects, isolates and reroutes power in the most efficient way when problems occur (Roberts). Pacific Gas & Electric Company is testing drones as a means to monitor and evaluate electric infrastructure systems in hard-to-reach areas. The ease of access will allow more frequent and consistent monitoring and drastically reduce the amount of methane leaks and other unwanted disruptions. (Roberts). Nissan (manufacturer of the world’s best-selling electric car, the Leaf) and ENEL (Europe’s second largest power company) have teamed to develop an innovative vehicle-to-grid (V2G) system that creates mobile energy hubs, which also integrates the electric cars and the power grid. The system allows Leaf owners to charge at low-demand, cheap-tariff periods, while allowing owners to use the energy stored in the car’s battery to power their home during peak periods, or when power goes out. Owners can store excess energy, or return it to the grid, making the entire system more efficient for everyone (“Nissan and ENEL to test first Grid Integrated Vehicles in Denmark,” Copenhagen Capacity, December 11, 2015). As evidenced by these specific use cases, IoT technology is making energy-intensive systems in power generation and in manufacturing far more efficient. It’s good for the environment, but it’s also good for business. Intelligent implementation of energy saving technology stands to benefit every business, from small commercial enterprises to the largest power producing utility companies in the world. It’s time to make the move to smarter energy usage, for both the environment and for your bottom line. Richard Meyers is a former high school teacher in the SF Bay Area who has studied business and technology at Stanford and UC-Berkeley. He has a single-digit handicap in golf and is passionate about cooking, wine and rock-n-roll. Over the past few decades, we’ve gotten used to the Internet and cannot imagine our lives without it. Millennials and new age kids don’t even know what is life without being online. With the disruption of Digital Transformation, Internet of Things have added lots of opportunities to business and consumers like us, equally. IOT means connecting things, extracting data, storing, processing and analyzing in big data platforms and making decisions based on analytics. It helps in predicting certain outcomes thereby helping with taking preventive actions. The popularity of wearables, such as fitness trackers, blood glucose monitors and other connected medical devices, has taken healthcare by storm. Connected devices have become a prevalent phenomenon in the consumer space and have made their way into healthcare. Healthcare is fast adopting IoT & changing rapidly, as it reduces costs, boosts productivity, and improves quality. IoT can also boost patient engagement and satisfaction by allowing patients to spend more time interacting with their doctors. There are a number of opportunities for the internet of things to make a difference in patients' lives. IoT-enabled devices capture and monitor relevant patient data and allow providers to gain insights without having to bring patients in for visits. Adding sensors to medicines or delivery mechanisms allows doctors to keep accurate track of whether patients are sticking to their treatment plan and avoid patient's readmission. Patients are using these connected medical products to capture ECG readings, record medication levels, sense fall detection and act as telehealth units. Diabetes self-management includes all sorts of gadgets and devices, which control glucose levels and remind patients to take their insulin dose. The newest wearables are even capable of delivering insulin on their own, according to health condition indicators. Remote patient monitoring is one of the most significant cost-reduction features of IoT in healthcare. Hospitals don’t have to worry about bed availability, and doctors or nurses can keep an eye on their patients remotely. At the same time, patients usually feel more relaxed at home and recover faster. Smart beds are a convenient solution for patients who have trouble adjusting bed positions on their own. This kind of IoT tool can sense when the patient is trying to move on their own and it reacts by correcting the bed angle or adjusting pressure to make the person more comfortable. Additionally, this frees up nurses, who don’t have to be available all the time and can dedicate extra time to other duties. Many hospitals have already introduced smart beds in their rooms. Newborn babies are given wristbands, allowing a wireless network to locate them at any time. They have installed wireless sensors in refrigerators, freezers and laboratories to ensure that blood samples, medications and other materials are kept at the proper temperatures. Hospital has more than 600 infusion pumps which are IoT enabled. BMC staff members can now dispense and change medications automatically through the wireless network, rather than having to physically touch each pump to load it up or make changes. At Florida Hospital, when patients go in for surgery, they're tagged with real-time location system (RTLS) badges that track their progress through from the pre-op room to the surgical suite to the recovery unit so relatives can track the patients from outside. Philips GoSafe can be worn as a pendant and it helps to detect and alert falls in elderly people. The Internet of these Medical Things is a game-changer as future will be connected, integrated & secure healthcare industry. The IoT needs to be distinguished from the Internet. The Internet, of course, represents a globally connected number of network, irrespective of a wired or wireless interconnection. IoT, on the other hand, speciﬁcally draws your attention to the ability of a ‘device’ to be tracked or identiﬁed within an IP structure according to the original supposition. Terminator or Iron Man – What will AI bring in future? In the age of Digital Transformation, Artificial Intelligence has come a long way from Siri to driverless cars. If you have used a GPS on Google Maps to navigate in your car, purchased a book recommended to you by Amazon or watched a movie suggested to you by Netflix, then you have interacted with artificial intelligence. Artificial Intelligence is the capability of a machine to imitate intelligent human behavior which relies on the processing and comparison of vast amounts of data in volumes with help of big data analytics, no human being could ever absorb. Stephen Hawking, Elon Musk, Bill Gates have recently expressed concern in the media about the risks posed by AI. According to them, AI will soon replace all kinds of manual tasks and make humans redundant. This could be true in some sense but still this is a far cry from the current maturity levels of AI, which is still at the stage of figuring out real-world use cases. Today machines can carry out complex actions but without a mind or thinking for themselves. Smartphones are smart because they are responding to your specific inputs. The world’s top tech companies are in a race to build the best AI and capture that massive market, which means the technology will get better fast, and come at us at faster speed. IBM is investing billions in its Watson, Apple improving Siri, Amazon is banking on Alexa; Google, Facebook and Microsoft are devoting their research labs to AI and robotics. Together, they will swirl into that roaring twister, blowing down the industries and businesses in its path. Within maybe few years, AI will be better than humans at diagnosing medical images and converting speech to emotions. But it can also be stealing millions of records from a government agency to identify targets vulnerable to extortion. Soon you’ll be able to contact an AI doctor on your smartphone, talk to it about your symptoms, use your camera to show it anything it wants to see and get a diagnosis that tells you to either take a couple of Tylenols or see a specialist. In all the fairy tales we have seen so far, good almost always wins over evil. This is what we have seen in the movies like I, Robot or Avengers: Age of Ultron. But Will Smith or team of avengers does not know that till end of the story. That’s where we are now: face to face with the demon for the first time, doing everything we can to get through the scary plot alive. · Google Translate applies AI in not only translating words, but in understanding the meaning of sentences to provide a true translation. · IBM Watson is the most prominent example of AI based question answering via petabytes of data retrieval that helps in various areas like finance, healthcare & insurance. As Humans we are programmed from childhood either by nurture or nature to do things the way we do. All the nine emotions we have learned since then are the inseparable part of our lives. Currently we are in the control of the planet because we are smartest species compared to all the animals. But when, and if machines learns to love or hate, work in peace or retaliate in anger, then it’s not too far that, with the ability to consume & digest the vast amount of data, they will become more smarter & start taking control of the planet. Only then we will be able to know that AI is helping us like Iron Man's Jarvis or planning to eradicate us like Terminator!! The widespread use of the Internet of Things (IoT) is systematically impacting worldwide growth in online transactions, and research from Gartner underscores that this trend shows no signs of waning. This compounding growth in connected devices and their use in online transactions has created new challenges for merchants trying to stay compliant with a complex web of global ecommerce regulations that vary by country and state. As merchants bear the burden of regulatory compliance, they need to be able to quickly adapt to changes to ensure competitive advantage and sustained success. Take the popular “driver for hire” company Uber. A few years ago in India, Uber’s largest market behind the U.S., the government closed a loophole in a 2009 law. The amended law required two-step authentication (with verification codes sent via text or email) for any “card not present” transaction. In other words, the ease of the Uber app’s payment system was now illegal for the sake of added consumer protection. This not only put the company at risk of noncompliance in India, but the change could have shut down the company’s operations in India altogether. Even though Uber acted quickly and updated its app, consider the potential negative consequences had it not been able to pivot: heavy fines, potential lawsuits or, even worse, allowing an opportunistic competitor to strategically enter the region. The ability to nimbly pivot when facing unexpected changes is what has, in part, given industry leaders like Uber market dominance. This past November, the EU introduced legislation banning unjustified geo-blocking between European member states to boost ecommerce across the region. Geo-blocking is a discriminatory practice preventing customers from making online purchases outside of their resident nation. With the new legislation, a consumer in France, for instance, can purchase goods off a German ecommerce site instead of being re-routed to the French site, where prices may be higher. This measure was made to promote – rather than restrict – commerce in the EU , forbidding traders from blocking or limiting customer access to their online interface based on nationality or place of residence. And while the new legislation provides a tremendous advantage for the consumer, it forces merchants to adjust how they’d previously done business. Opening up the market, merchants not only lost their price discrimination leverage, but also had to ensure they updated their payment processing and other systems to avoid business disruption and remain compliant. Ultimately, those that are flexible enough to address these requirements will thrive over less nimble competitors. Will products enabled with automated subscription services (think Tide detergent ordering replenishment pods) have a required notification period before an order is placed? Will a consumer’s electronic signature be required before an order is authorized, as in the Uber example above? Does information that is collected and related to health and wellness, such as fitness tracker/health band data, fall under the protection of additional medical regulations like HIPAA (in the United States)? How merchants navigate this murky regulatory landscape is critical. Each new regulation can reset the competitive playing field, making flexibility a company’s most important asset. Companies have every reason to be opportunistic as regulations shift and new opportunities arise. The trick is to put your company in a position to turn the inevitable complexity of global commerce compliance into a competitive advantage – something that may be giving merchants headaches now, but will be well worth the pain once the groundwork has been laid. The rise of the Internet of Things was just the beginning. There is something much bigger brewing. It’s called the Internet of Everything — otherwise known as IoE. Instead of the communications between electric-powered, internet-connected devices that the IoT allows, the IoE expands it exponentially. The IoE extends well beyond traditional IoT boundaries to include the countless everyday, disposable items in the world. If the IoT is the solar system, then the IoE is every galaxy in the universe. Today we are into digital age, every business is using big data and machine learning to effectively target users with messaging in a language they really understand and push offers, deals and ads that appeal to them across a range of channels. With exponential growth in data from people and & internet of things, a key to survival is to use machine learning & make that data more meaningful, more relevant to enrich customer experience. Machine Learning can also wreak havoc on a business if improperly implemented. Before embracing this technology, enterprises should be aware of the ways machine learning can fall flat. Data scientists have to take extreme care while developing these machine learning models so that it generate right insights to be consumed by business. Here are 5 ways to improve the accuracy & predictive ability of machine learning model and ensure it produces better results. · Ensure that you have variety of data that covers almost all the scenarios and not biased to any situation. There was a news in early pokemon go days that it was showing only white neighborhoods. It’s because the creators of the algorithms failed to provide a diverse training set, and didn't spend time in these neighborhoods. Instead of working on a limited data, ask for more data. That will improve the accuracy of the model. · Several times the data received has missing values. Data scientists have to treat outliers and missing values properly to increase the accuracy. There are multiple methods to do that – impute mean, median or mode values in case of continuous variables and for categorical variables use a class. For outliers either delete them or perform some transformations. 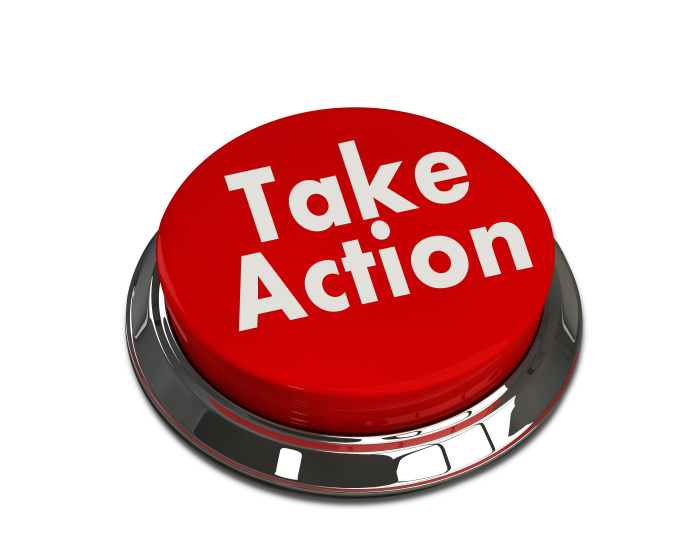 · Finding the right variables or features which will have maximum impact on the outcome is one of the key aspect. This will come from better domain knowledge, visualizations. It’s imperative to consider as many relevant variables and potential outcomes as possible prior to deploying a machine learning algorithm. · Ensemble models is combining multiple models to improve the accuracy using bagging, boosting. This ensembling can improve the predictive performance more than any single model. Random forests are used many times for ensembling. · Re-validate the model at proper time frequency. It is necessary to score the model with new data every day, every week or month based on changes in the data. If required rebuild the models periodically with different techniques to challenge the model present in the production. There are some more ways but the ones mentioned above are foundational steps to ensure model accuracy. Machine learning gives the super power in the hands of organization but as mentioned in the Spider Man movie – “With great power comes the great responsibility” so use it properly. Beyond SMAC – Digital twister of disruption!! Have your seen the 1996 movie Twister, based on tornadoes disrupting the neighborhoods? A group of people were shown trying to perfect the devices called Dorothy which has hundreds of sensors to be released in the center of twister so proper data can be collected to create a more advanced warning system and save people. Today if we apply the same analogy – digital is disrupting every business, if you stand still and don’t adapt you will become digital dinosaur. Everyone wants to get that advance warning of what is coming ahead. Even if your business is doing strong right now, you will never know who will disrupt you tomorrow. Mobile, Analytics and Cloud technologies. Gone are the days when we used to wait for vacations to meet our families and friends by travelling to native place or abroad. Today all of us are interacting with each other on social media rather than in person on Facebook, Whastapp, Instagram, Snapchat and so on. Mobile enablement has helped us anytime, anywhere, any device interaction with consumers. We stare at smarphone screen more than 200 times a day. Analytics came in to power the hyper-personalization in each interaction and send relevant offers, communications to customers. The descriptive analytics gave the power to know what is happening to the business right now, while predictive analytics gave the insight of what may happen. Going further prescriptive analytics gave the foresight of what actions to be taken to make things happens. Cloud gave organizations the ability to quickly scale up at lower cost as the computing requirements grow with secure private clouds. Today we are in the 6 thwave of disruption beyond SMAC era - into Digital Transformation, bringing Big Data, Internet of things, APIs, Microservices, Robotics, 3d printing, augmented reality/virtual reality, wearables, drones, beacons and blockchain. Big Data allows to store all the tons of data generated in the universe to be used further for competitive edge. Internet of Things allows machines, computers, smart devices communicate with each other and help us carry out various tasks remotely. APIs are getting lot of attention as they are easy, lightweight, can be plugged into virtually any system and highly customizable to ensure data flows between disparate systems. Microservices are independently developed & deployable, small, modular services. Robotics is bringing the wave of intelligent automation with help of cognitive computing. 3D printing or additive manufacturing is taking the several industries like medical, military, engineering & manufacturing by storm. Augmented reality / virtual reality is changing the travel, real estate and education. Wearables such as smart watches, health trackers, Google Glass can help real time updates, ensure better health & enable hands-free process optimization in areas like item picking in a warehouse. Drones have come out of military zone and available for common use. Amazon, Dominos are using it for delivery while Insurance & Agriculture are using it for aerial surveys. Beacons are revolutionizing the customer experience with in-store analytics, proximity marketing, indoor navigation and contact less payments. The new kid on the block is blockchain where finance industry is all set to take advantage of this technology. As products and services are getting more digitized, traditional business processes, business models and even business are getting disrupted. The only way to survive this twister is to get closer to your customers by offering a radically different way of doing business that’s faster, simpler and cheaper. We have now entered an era with a new virtual revolution, particularly, the Internet of things (IoT). The virtual revolution marks the starting of information age. We use the Internet almost every day. The net has turned out to be one of established ways for us to work together, to share our lives with others, to shop, to teach, to research, and to learn. However the next wave of the Internet isn't about people. it's far about things, honestly? IoT is defined as the network of physical objects that can be accessed through the Internet. These objects contain embedded various technology to interact with internal states or the external environment. IoT is characterized as "the figuring frameworks of sensors and actuators associated by systems, where the processing frameworks can screen or deal with the status and actions of connected objects and machines, and the connected sensors can likewise screen the characteristic world, individuals, and creatures." The center of IoT is not just about interfacing things to the Internet. It is about how to generate and use the big data from the things to make new values for individuals, and about how we empower new trades of significant worth between them. In other words, when objects can sense and communicate, IoT has its knowledge to change how and where choices are made, and who makes them, and to pick up a superior esteem, solution or service. Fundamental to the estimation of IoT is in actuality the Internet of smart things (smart IoT). Supported by intelligent optimization, smart IoT can increase productivity of work and enhance quality of lives for people. Let us take “cities” — the engines of global economic growth — as an example. Smart cities have the potential to dramatically improve the lives of everyone. In intelligent transportation systems (ITS), smart IoT can not only monitor the status of the transportation, but also optimize traffic signal controls to solve traffic congestion and provide the travelers with better routes and appropriate transportation information, etc. Combining IoT and machine learning (ML) can also make our roads safer. Profits by smart IoT have been shown also in health-care, logistics, environment, smart home, in the aspects of better quality, energy conservation, efficiency increase, and so on. Smart IoT remains in its infancy now in terms of the technology development and the effect on our global economy system and our daily lives. Maximum IoT statistics aren't used presently within the era of big data. Maximum IoT has no intelligence inside the generation of artificial intelligence (AI). IoT which might be used these days are on the whole for anomaly detection and control, as opposed to optimization and prediction. Given the brilliant anticipated increase of the Internet over the following 10 years, it is considered one of vital challenges and possibilities for us to invent and practice in real-global programs on a way to make the IoT smarter to generate the greatest value. Analytics has taken world by storm & It it the powerhouse for all the digital transformation happening in every industry. Today everybody is generating tons of data – we as consumers leaving digital footprints on social media, IoT generating millions of records from sensors, Mobile phones are used from morning till we sleep. All these variety of data formats are stored in Big Data platform. But only storing this data is not going to take us anywhere unless analytics is applied on it. Hence it is extremely important to close the loop with Analytics insights. Artificial Intelligence: AI is the capability of a machine to imitate intelligent human behavior. BMW, Tesla, Google are using AI for self-driving cars. AI should be used to solve real world tough problems like climate modeling to disease analysis and betterment of humanity. Crisp-DM: is the cross industry standard process for data mining. It was developed by a consortium of companies like SPSS, Teradata, Daimler and NCR Corporation in 1997 to bring the order in developing analytics models. Major 6 steps involved are business understanding, data understanding, data preparation, modeling, evaluation and deployment. Data preparation: In analytics deployments more than 60% time is spent on data preparation. As a normal rule is garbage in garbage out. Hence it is important to cleanse and normalize the data and make it available for consumption by model. Ensembling: is the technique of combining two or more algorithms to get more robust predictions. It is like combining all the marks we obtain in exams to arrive at final overall score. Random Forest is one such example combining multiple decision trees. Feature selection: Simply put this means selecting only those feature or variables from the data which really makes sense and remove non relevant variables. This uplifts the model accuracy. Gini Coefficient: it is used to measure the predictive power of the model typically used in credit scoring tools to find out who will repay and who will default on a loan. Histogram: This is a graphical representation of the distribution of a set of numeric data, usually a vertical bar graph used for exploratory analytics and data preparation step. Independent Variable: is the variable that is changed or controlled in a scientific experiment to test the effects on the dependent variable like effect of increasing the price on Sales. KNN: K nearest neighbor algorithm in Machine Learning used for classification problems based on distance or similarity between data points. Lift Chart: These are widely used in campaign targeting problems, to determine which decile can we target customers for a specific campaign. Also, it tells you how much response you can expect from the new target base. Model: There are more than 50+ modeling techniques like regressions, decision trees, SVM, GLM, Neural networks etc present in any technology platform like SAS Enterprise miner, IBM SPSS or R. They are broadly categorized under supervised and unsupervised methods into classification, clustering, association rules. Neural Networks: These are typically organized in layers made up by nodes and mimic the learning like brain does. Today Deep Learning is emerging field based on deep neural networks. PMML: this is xml base file format developed by data mining group to transfer models between various technology platforms and it stands for predictive model markup language. Quartile: It is dividing the sorted output of model into 4 groups for further action. R: Today every university and even corporates are using R for statistical model building. It is freely available and there are licensed versions like Microsoft R. more than 7000 packages are now available at disposal to data scientists. Sentiment Analytics: Is the process of determining whether an information or service provided by business leads to positive, negative or neutral human feelings or opinions. All the consumer product companies are measuring the sentiments 24/7 and adjusting there marketing strategies. Text Analytics: It is used to discover & extract meaningful patterns and relationships from the text collection from social media site such as Facebook, Twitter, Linked-in, Blogs, Call center scripts. Unsupervised Learning: These are algorithms where there is only input data and expected to find some patterns. Clustering & Association algorithms like k-menas & apriori are best examples. Visualization: It is the method of enhanced exploratory data analysis & showing output of modeling results with highly interactive statistical graphics. Any model output has to be presented to senior management in most compelling way. Tableau, Qlikview, Spotfire are leading visualization tools. What-If analysis: It is the method to simulate various business scenarios questions like what if we increased our marketing budget by 20%, what will be impact on sales? Monte Carlo simulation is very popular. What do think should come for X, Y, Z? Remember when you were teenager and wanted to go on vacation with parents-you were asked to go to travel agent and get all the printed brochures of exotic locations? Then came the dot.com wave and online booking sites like Expedia, Travelocity, Makemytrip paved so much that took travel agencies out of equation. We used to send holiday postcards to our friends and families back home, which are gone out of business due to social media postings on Facebook, Instagram. Lonely Planet used to be the traveler’s bible, but now we go to tons of websites like TripAdvisor, Priceline which provide us with advice and reviews on hotels, tours and restaurants. The travel industry, like many others, is being disrupted by great ideas powered by digital technology and innovation. All such digital footprint of customers are collected and then analyzed by big data analytics to hyper personalized the experience. With extensively networked digital properties and deep hooks into customer data collected via travel booking sites and social media channels, travel companies are delivering customized dream vacations according to the likes and preferences of today’s travelers. Today’s trend is towards spending money on memories & experiences instead of material possessions. Accordingly, travel companies are investing in their digital storefronts and omni-channels to keep today’s hyper-connected travelers snapping, sharing, researching and reviewing on the fly – leaving immense data footprints for marketers to leverage. Bluesmart is a high-quality carry-on suitcase that you can control from your phone. From the app you can lock and unlock it, weigh it, track its location, be notified if you are leaving it behind and find out more about your travel habits. Thomas Cook have introduced virtual reality experiences across select stores. Digital disrupters like Airbnb have already put tremendous pressure on hotels. Starwood Hotels have launched “Let’s chat”, enabling guests to communicate with its front desk associates via WhatsApp, Blackberry messenger or iPhone before or during their stay. Data quality is one of the few fundamental truths to consider when architecting an IoT solution. Adopting a "pull" model for data sharing makes it easier to keep dirty data from infecting other systems and jeopardizing data quality across your enterprise environment. Manufacturing companies have traditionally been slow to react to the advent of digital technologies like intelligent robots, drones, sensor technology, artificial intelligence, nanotechnology & 3d Printing. replenishment, trigger manufacturing and much more. What is the difference between UX & UI? Remember when we were young and wanted to use ketchup and it did not fall down from the glass bottle in the dish? We had to turn the bottle upside down and smack it on the bottom to pour it. The company did not realize that making the glass bottle with attractive label looks good but actual experience of using it is very bad. That is the simple difference between user interface (the glass bottle) and user experience (pouring the ketchup). A User interface is a simple, intuitive means for a user to interact with PCs, smart mobile devices, websites, communication devices, and software applications. All our five senses Sight, Sound, Smell, Touch and Taste are user interface for us to interact with the world and what we get is user experience of the world. Today with so much digital all around us, User interface (UI) focuses on the look and feel of screens, pages, forms, text boxes, and visual elements, like images, videos, buttons and icons that you use to interact with a device, web site or product. User experience (UX), on the other hand, is the experience that a person has as they use, interact with products and services. Imagine when you ask a query to Google and it took more than 1 minutes to get a result. Even if the interface stayed the same, your experience with Google would be dramatically different. UI will more focus on look and feel, responsiveness of the product. It cares for if the function works or not. UX design not only cares for its function but the users' emotion, how the users feel about when their interaction to UI. Positive User experience enhances customer satisfaction and loyalty by improving the usability, ease of use, and pleasure provided in the interaction between the customer and the product. UI is when you go to a five star hotel for dinner and see food arranged beautifully and UX is when you eat it to find it fantastic too. You must have visited Disneyland with your kids….the attractive colors, and themes they use to pull the crowds of children and adults at same time is user interface while after sitting on the rides like space mountain, rock n roller coaster, free fall etc. what you get is thrilling user experience. Your Car’s steering wheel, brakes, accelerator are all UI, while kind of experience you get driving is UX. Your UI design can make or break the success of your website or app and it is the door to the great or worst user experience. Something that looks great but difficult to use and something that looks terrible but very easy to use, both are failures in today’s digitalage. UX and UI are the two most integral concepts in the world of website development. Both need to work well in relation to each other to offer the best overall outcome. IoT Generalist vs IoT Specialist, Who will survive to the era of Robots? A few weeks ago, when I returned from the MWC and I wrote about “The wandering souls Network”, I wondered if it would not have been better for my career if I had specialized in a very specific area instead of being a generalist. I think there are decisions in our life that in spite every of us can analyse many times, the final decision will be always the same, because each person is the way he is. Although the rest of this article can possibly be applied to all White Collar professionals, I'm going to focus on how will affect your decision of being an IoT specialist or an IoT generalist in a futuristic world dominate maybe by Robots. Before start examining the pros and cons of becoming an IoT generalist or a IoT specialist in this competitive and unfair world, it’s important to understand the distinction of these two approaches and how they relate to our future career path. The Merriam-Webster dictionary’s simple definition of a generalist states a generalist is “a person who knows something about a lot of subjects”. A specialist is defined as “a person who has special knowledge and skill relating to a particular job, area of study”. An IoT Generalist is a professional that understand a bit of everything. The IoT Generalist can speak about new business models enabled by IoT, the value of ecosystems, all kind of networks connectivity, protocols, sensors, devices, Gateways, Architecture, Cloud Platforms, Edge Analytics or Predictive Maintenance. And of course, he must be up to date of standards and security. Such a professional should be able to present to C-Level but also to maintain an intelligent conversation with different technical people. A value added of an IoT Generalist is his/her social network reputation, industry expertise recognition and strategic relationship with IoT/IIOT vendors, Telcos, Analyst, System Integrators. Being an IoT generalist also require a skill-set of project management, effective communication and good people skills. But possibly to survive the future era of robots, it may matter little to be an IoT Generalist or Specialist and you will need a mix of a (someone who starts out as a generalist, but also has in-depth knowledge over a particular area) or specializing-generalist (someone who is specialized in a particular field, but also has a broader understanding of other aspects of the business) as Lev Kaye, the founder and CEO of CredSpark, wrote. Remember that moving between both extremes can be extremely difficult once a career path has been embarked upon, so the mix is always good to have. There is, of course, opportunity to move between general and special IoT roles. But the more experience a professional gain in one area or the other, the more difficult it becomes to make a transition, at least without suffering from a dramatic salary loss. There are benefits and downsides to both career routes. In the following table I have included some upsides and downsides of becoming an IoT generalist versus becoming an IoT specialist. Having a good understanding of a wider selection of IoT topics can help make better decisions and find solutions that a specialist might not be able to see. In a fast-changing workplace, IoT generalist transferable skills will become increasingly important and will be less restricted with their career opportunities. The salaries tend to be higher, even at the starting point and can also provide more internal power. You can become a widely recognized leader in your field. By simply knowing the surface you can easily be replaced by another generalist. Become a widely recognized leader will require specialization. The narrowed focus and expert skills in an area mean IoT Specialist can only find work in this narrow field. · The opinion on other issues might not be as valid if the topic at hand not involve your area of expertise directly. Age does matter - Which path is right for you? My Opinion: If you are under 30 you need to stay on top of your areas of IoT expertise and be willing to move when your expertise becomes a commodity or obsolete. This requires vigilance and the willingness to move with industry trends. You must be aware of disruptive trends in IoT technologies. Take into account that in the future, the IoT Specialists will be also under threat from software and robots. But if you have already passed the barrier of 45 years and suddenly you want to use your background and experience to sell yourself as an IoT Generalist, remember that you have 6 months to demonstrate your added value (most of the time you will be required for selling) or you will be fired without any leniency. My Opinion: As an IoT Generalist over 45 you will find harder and harder to get hired. You need to be creative and become at least in spirit an entrepreneur. You must continue creating your own brand and reputation and extending your network with key people in the industry. Opportunities for IoT Generalist will not be forever but they must fight project by project. It would not hurt to start specializing in any of the IoT tracks. And Enterprise size matters too. What are you looking for? Governments insist to sell us the importance of entrepreneurs for the well-being and sustainable development of countries and encourage us to create startups. Of course, there is no work for life except for Government employees. And it is known that the big multinationals are rewarded in stock market by the number of employees that are fired out each quarter. Even so, startups are possibly the only way out for IoT Specialist under 25 or IoT Generalist over 45. · If you are an IoT Generalist over 45, find a job in IoT startups will be a chimera, except as Sales roles. Launching your own startup with other partners can be a better option. · If you are an IoT Specialist under 25 you can try to convince other colleagues to create a Startup and enter in the dynamic of find investors, win awards and pray for a stroke of luck. If you decide to work in an existing startup to get experience and you are not a Founder or Co-Founder, you must be prepared to be exploited, and then move to a Big company. IoT Generalists add value specially to medium to big international companies. Knowing the details about the complex ecosystem and can handle a vast array of technical concerns is becoming critical for SMBs. There is little need for IoT specialist as there are not enough technical needs in any one specific area to warrant a full-time staff member dedicating themselves to them. This does not mean that if you are an IoT Specialist you should not try to work for a SMB. Other consideration like industry knowledge, proximity or quality of life will compensate the promises of more money and relevance in Big International companies. · If you are an IoT Specialist under 25 and you do not pursue the fame of being a number in a Big international company, you can enjoy more in a SMB because you will have more probability to become more quickly a specializing-generalist. Here we must separate into two types of companies: Top IoT companies including Big IT and OT vendors and End Customers. There are many lists of Top IoT companies. Almost always these lists include the habitual suspects, and as usual they have notable absences and without forget that the ranks leave much to be desired. But at least such type of list provide the names of companies that either IoT Specialists of IoT Generalists should be searching for a job. End Customer will need help from both IoT Generalist and IoT Specialist, the question is when and who are them? · The desire of an IoT Generalist over 45, that used to work on Big Companies, is return to a Top IoT Company or Big Enterprise. Although it would seem easy, it is by no means a road of roses. You must create your own strong personal brand and be a well-known and influencer of the industry. · If you are an IoT Specialist under 25 with experience in startups you will be hunted soon for one of IoT Top vendor. Do not let yourself be blinded by the name of the company, but the project and the future importance of IoT within it. Not because I attend the MWC that specifically caused me to think back on the changes that will occur in the IoT job landscape, it was this conference in addition to the many other IoT events that I attended over the past years that make me think how IoT professionals will be living the strong gravitational rift as we approach to 2025 and beyond. Unemployment is one of the main problems in today consumer owned society. The unemployment is especially cruel to young people in search of their first job. But also for those who have passed the barrier of 45 (IF $your age is >45 THEN "sorry you are overqualified”). When I wrote “Your job will be in our special metal hands” I imagined a near future in which companies will use Recruitment Robots to search, identify, select and manage candidates and employees more efficiently. Although it is crucial you follow your heart and your passion when making the decision you should consider the requirements of future employers will be robots. If today, what matters is knowing a little of everything in the Internet of Things, an IoT Generalist, cross-trained and energetic. Fast forward a few years, and the IoT profession will took a different turn. IoT Specialists must emerge, particularly in larger organizations. IoT Specialist should also be aware of the way IoT jobs will change. Several traditional IoT specialist jobs today will be facing the threat of automatization and will not have an easy time beyond 2025. When deciding between IoT generalist and IoT specialist career paths, you need to carefully consider the type of person you are. Ultimately, the advantages and disadvantages of either path depend on your personality and drive. If you work hard towards achieving your career goals, you can do so as an IoT specialist and as an IoT generalist and remember you need to be passionate and your attitude will matter today and beyond 2025. IoT Specialist or IoT Generalist? Choose your own destiny. Many organizations today have realized that digital transformation is essential to their success. But many of them forget that focus of a digital transformation is not digitization or even technology, it is the Customer! Digital Transformation is not easy or small endeavor for any business. Several levers will need to be turned in unison just to ensure resources are aligned and budgets are not being wasted. Many a times I have seen that the top boss is not digital savvy. In such cases without top leadership, they are unlikely to have real impact on their road to digital. Another reason is, many companies focus on siloed, just few digital projects instead of overall business model transformation. Such independent, tactical initiatives, which are costly and create bad publicity inside and outside the organization. I had a worst experience with one of the largest telecom company. While acquiring customers they go out the way to give everything free and promise everything digital. But their customer service is pathetic. I just wanted to disconnect my internet dongle and it was not possible online. I had to call customer service 5-6 times, every time I was kept on hold saying they are checking system status. At one time, when I got frustrated I asked why it is painful just to disconnect, the rep told me sir your call has just consumed 39 seconds and we are trained to hold customer for more than a minute!!! See how they earn money at customer’s cost. Finally they told me go and sort it out in one of their store. Again no digital there – I had to fill out a hard copy form, provide all my id proofs again, and I was told it will take 10 more days to just disconnect the service, so I have to pay for those 10 days. What is worst is, I again get a bill after 1 month that I have not paid latest bill. 5. They provide email updates letting customers know the status on their requests. But if they had walked in customer’s shoes, to identify instances where things could do wrong and address them quickly, it would have been more successful. If with everything at the end the customer experience is bad it is a failure. Lack of clear vision - Often times, companies that are not succeeding simply haven't painted a clear picture of what they want or need to be, when they digitally "grow up." Poor internal communication within employees is another critical reason to fail. All the customer touch points don’t communicate with each other to have single version of customer truth. A comprehensive use of Big Data Analytics is essential to have all the details of customer at service rep’s fingertips. Amazon, Netflix and Uber digital success stories have the effective gathering, storing and leveraging of customer data at the core. Forrester has cited example of digital transformation failure at BBC for weak project management, reporting, lack of focus on business change. Which reasons resonate with you? Happy to hear your thoughts! The Internet of Things (IoT) is a technology that extends digital connectivity to devices and sensors in homes, businesses, vehicles and potentially almost anywhere. This advance enables virtually any device to transmit its data, to which analytics can then be applied to facilitate monitoring and a range of operational functions. IoT can deliver value in several ways. It can provide organizations with more complete data about their operations, which helps them improve efficiencies and so reduce costs. It also can deliver a competitive advantage by enabling them to reduce the elapsed time between an event occurring and operational responses, actions taken or decisions made in response to it. IoT utilizes what Ventana Research calls operational intelligence, a discipline that has evolved from the capture and analysis of data from instrumentation and machine-to-machine interactions of many types. We define operational intelligence as a set of event-centered information and analysis processes operating across an organization that deliver information to enable effective actions and optimal decisions. The evolution of operational intelligence and its manifestation in IoT is encouraging companies to revisit their priorities and spending for information and other digital technologies. 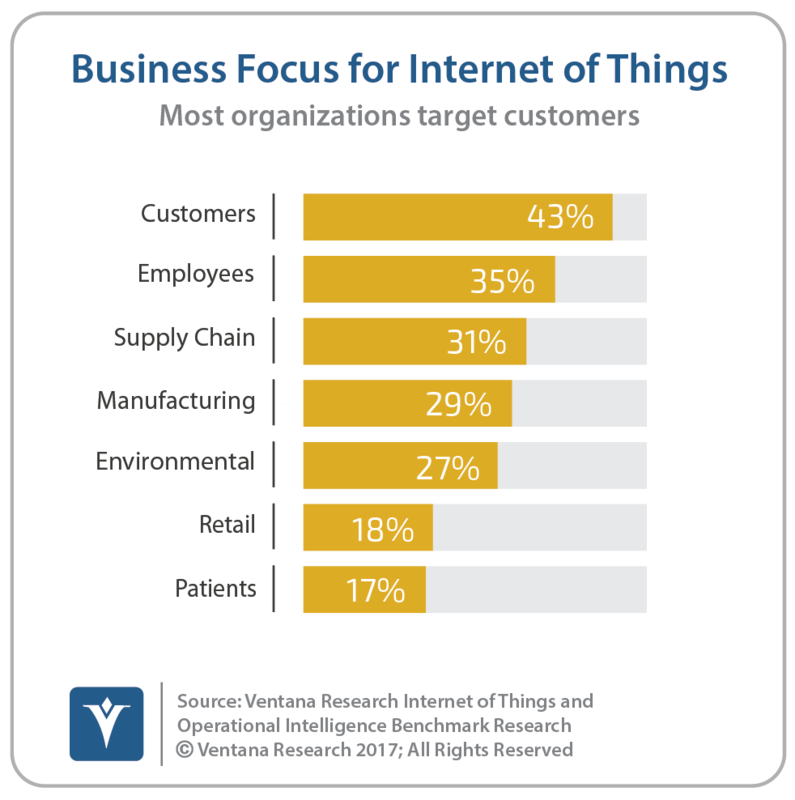 Ventana Research undertook benchmark research on The Internet of Things to determine the attitudes, requirements and future plans of organizations that use IoT and operational intelligence systems and to identify their best practices. We set out to examine both the commonalities and the qualities specific to major industry sectors and across sizes of organizations. We considered how organizations manage IoT, issues they encounter in the process and how their use of it and related technology is evolving. While the Internet of Things may still be a novelty to many consumers, organizations participating in our research are well aware of its applications and implications. Four out of five (81%) said IoT is important to their future operations. Majorities said the use of IoT is very important to speed the flow of information and improve the responsiveness of individuals within business processes (61%) and to speed the flow of information to customers or consumers (58%). The most common uses of IoT are associated with customers (as in sensors on products, by 43%), employees (in wearable technology, 35%) and sensors on devices in the supply chain (31%). At this point, however, more organizations are able to capture IT events (such as a network or system security breach, 59%) than business events (such as a customer contact, 45%). As organizations find more business uses, IoT and operational intelligence will become even more mainstream, and the research indicates that this will occur. Within two years, 95 percent of organizations said they expect to be capturing IT events and 92 percent to be capturing business events. The research also finds that the intentions of organizations to embrace IoT and use operational intelligence often outpace their current capabilities. For example, many can capture data but face challenges in using it. More than two-thirds (68%) said they are satisfied or somewhat satisfied with their organization’s ability to capture and correlate data from events. After that, managing and using it become more complicated. Nearly one-third (31% each) reported difficulties with inadequate data or in managing external data. About half (48%) said they spend the most time reviewing event data for quality and consistency issues, which suggests a lack of standardization across the data sources that are collected. Furthermore, most organizations are not ready to derive maximum value from IoT. The processes most commonly implemented, each by approximately half of organizations, are performing root-cause analysis, defining measurements and metrics, and monitoring and correlating activities or events. While these processes are necessary, they are only the first step in improving performance. Fewer have advanced to the point of automating processes, which will be necessary to make full use of the coming deluge of IoT data. For example, only about two in five use data from events to trigger automated processes such as predictive maintenance (38%) or automatic assignment of thresholds for alerts (39%). This research overall finds strong momentum behind the emergence of the Internet of Things, but it also is clear that many organizations have not caught up to the trend. IoT is here, and its impact on business will only increase; almost all companies can benefit from paying attention to it. We encourage you to use this research to help educate and guide your organization through its IoT journey.